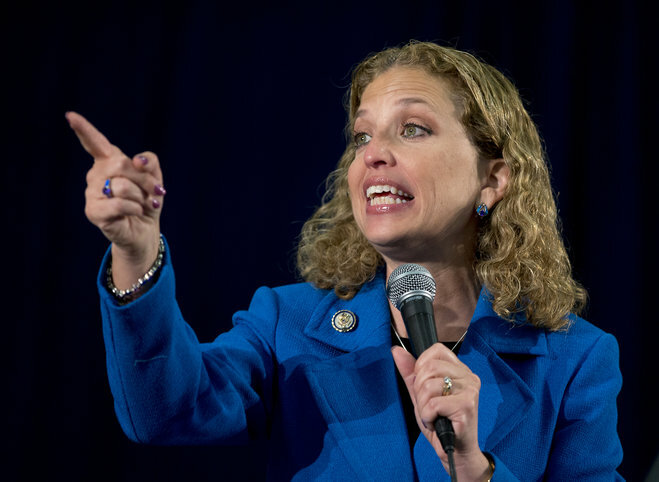 By Tom Kertscher, Amy Sherman on Thursday, September 4th, 2014 at 5:08 p.m.
Democratic National Committee chair Debbie Wasserman Schultz is shown speaking in Florida in 2012. On Sept. 3, 2014, in Milwaukee, she criticized Wisconsin Gov. Scott Walker's record on women. The South Florida congresswoman was the featured speaker in a round-table discussion on women's issues at the Milwaukee Athletic Club. She was joined by U.S. Rep. Gwen Moore, D-Milwaukee, and Wisconsin Democratic Party chair Mike Tate, among others. She added: "What Republican tea party extremists like Scott Walker are doing is they are grabbing us by the hair and pulling us back." Republican Wisconsin Lt. Gov. Rebecca Kleefisch said the remarks were "absolutely hideous and the motive behind them was despicable." And a spokeswoman for Mary Burke, the Democrat who is challenging Walker in the Nov. 4, 2014 election, said: "That's not the type of language that Mary Burke would use, or has used, to point out the clear differences in this contest." The following is a transcript by PolitiFact Wisconsin of key portions of Wasserman Schultz's remarks, based on a video of the roundtable event by Wisconsin Eye. After a few minutes of introductory comments, Wasserman Schultz turned her attention to the upcoming elections. "We know that the other side is playing for keeps. And what’s at stake for women in this election and in elections to come -- particularly if you’re a mom, a wife, a sister, a daughter, a granddaughter. "What matters for the women in America, for the women in our lives, is so personal. Because just look at what’s -- and you have only to look in this state to see what having a right-wing, tea party extremist governor means for the quality of life of women. Someone who has no regard for their quality of life, who actually has what I would say is disdain and disrespect. And the evidence that I would hold up is that, it’s one thing to have Republicans who oppose equal pay for equal work. That’s mind boggling in and of itself. "But then to take the extra step of actually repealing the enforcement mechanism to ensure that women in Wisconsin get equal pay for equal work? I know I ran for office, Gwen (Moore) ran for office, the women who are elected around this table and the women involved in the political process around this table, we all are involved in this process to make the world better, to help give people a hand up, to pull another woman up behind us on the rung of the ladder that we’ve just left, and to lift as we climb. "And Scott Walker has given women the back of his hand. And there is no -- I know that is stark. I know that is direct. But that is reality. When you have women earning 78 cents in Wisconsin for every dollar a man earns, and a governor who has actually signed a law that repeals that enforcement mechanism, that is just -- that is just unacceptable." An important note: In April 2014, Burke said Walker’s repeal of a 2009 law meant Wisconsin was one of just five states "without an equal pay law protecting women from gender discrimination in their paycheck." PolitiFact Wisconsin rated the claim False. Walker reversed an attempt to toughen up Wisconsin’s law, but its protections against gender discrimination in workplace pay date back decades. The governor’s 2012 action left those in place, albeit without tougher penalties for employers. "We are focused on making sure that our voters turn out. That they understand what’s at stake in this election. And let’s look at more nationally, what women believe about the Republicans’ policies. Because the Republicans themselves did a poll just about a week ago, that leaked out, that demonstrated exactly how women feel about Republican policies. "This is what women voters, polled nationally, said about Republicans in general. That same poll showed that women cited equal pay as the policy that would help them the most. So, when you ask women, what is the biggest obstacle to their success -- and what would help lift them up and give them more of a shot at being able to take care of their families, make sure that they can raise their kids, get them the best possible education so that they can succeed in the path they choose in life -- they say that the biggest obstacle is equal pay. "Because if you look at what women lose over the course of their professional lives by having unequal pay -- let’s say that the national average is 77 cents for every dollar a man earns -- the average woman loses over the course of her professional life, $430,000. You know what? That’s real money. No matter where you are." Another note: In his State of the Union address in January 2014, President Barack Obama said women "make 77 cents for every dollar a man earns." PolitiFact National rated the claim Mostly True. Our colleagues noted that the entire gap is not necessarily due to discrimination -- a conclusion some listeners might have drawn when hearing Obama mention "equal pay for equal work" shortly after citing the 77-cent figure. And there are alternative calculations that show a smaller overall gap. Still, the 77-cent ratio was a credible figure from a credible agency. "Every woman I know -- I have twin 15-year-olds and an 11-year-old. And there is nothing that matters to my husband and I more than making sure everything we do in our lives is done through the lens of being their parent and making sure that our commitment is -- results in making sure that, when they grow up, they have a better life than we did. Or at least as good. At least as good. "So instead, what Republican tea party extremists like Scott Walker are doing, is they are grabbing us by the hair and pulling us back. And it’s unacceptable. And it’s not going to happen on our watch." "I shouldn’t have used the words I used. But that shouldn't detract from the broader point that I was making that Scott Walker’s policies have been bad for Wisconsin women, whether it's mandating ultrasounds, repealing an equal pay law, or rejecting federal funding for preventative health care, Walker's record speaks for itself. As for the issue of domestic violence, it's unacceptable that a majority of Congressional Republicans opposed this critical legislation (the Violence Against Women Act), of which I was a proud cosponsor, after blocking its reauthorization for more than a year." "We know the intense voter suppression efforts that Scott Walker and his cronies have attempted. They’ve cut back on early voting days. They’ve attempted to try to impose photo ID in order to cast a ballot -- which by the way is nothing short of a poll tax, there is no way around it, and it specifically targets women. Women don’t often realize that voter ID makes it tougher for women to vote because, raise your hand if your voter registration, if your name on your voter registration, is different than your name on your driver’s license. It’s different on mine. Because so often women have their married name on one and their maiden name on the other." In 2012, PolitiFact fact-checked a claim by the ACLU comparing voter ID laws to a poll tax. "Since the 2008 election, more than 30 states have introduced laws that make it harder to cast a ballot. ... What’s more, most of these laws make it complicated and expensive to get an ID, essentially instituting a modern-day poll tax." The poll tax emerged in parts of the U.S. in the late 1800s as a blatant effort to restrict voting. Primarily aimed at minorities, these laws -- along with literacy tests -- disenfranchised many black, Native American and poor white citizens. The poll tax was outlawed in federal elections in 1964. The poll tax portion of the ACLU claim did not hold up. The cost part was more complicated to evaluate because the costs to obtain the IDs vary nationwide. We rated the ACLU’s claim Mostly False.